Give fine, limp hair a boost while soaking up any excess dirt and oils along with all your sins from the night before. 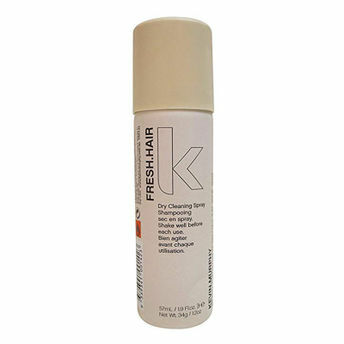 FRESH.HAIR by Kevin Murphy is a hardworking dry shampoo, that instantly freshens and deodorises to transform hair back to fresh, bouncy locks - it is the ideal way to boost hair having a midday meltdown. About the Brand: KEVIN.MURPHY is a fashion focused range of salon only, professional, hair care products created by Kevin to meet his needs as an editorial hairstylist. A master of his profession, no one understands the transformative power of hair better than Kevin Murphy. It's range of shampoos, conditioners, treatments and styling aids, is an indulgence of runway looks and natural aromatherapy catered for every hair type, each product designed to deliver performance, strength and longevity. The products are made from renewable and sustainable resources whenever possible, using pure essential oils, plant extracts and natural antioxidants and all hair products are sulphate and paraben free. Explore the entire range of Dry Shampoo available on Nykaa. Shop more Kevin.Murphy products here.You can browse through the complete world of Kevin.Murphy Dry Shampoo .Alternatively, you can also find many more products from the Kevin.Murphy Fresh.Hair Dry Shampoo Spray range.